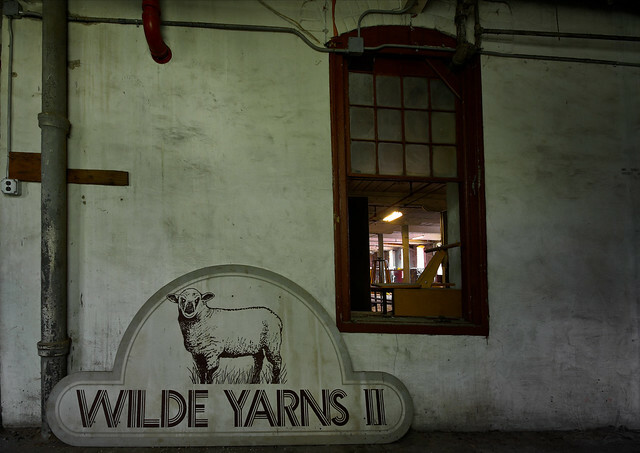 John Wilde and Brother, Inc., remains as a family owned woolen carpet yarn mill in continuous operation at this location since 1884, giving it the distinction of the oldest American carpet yarn company still in existence. 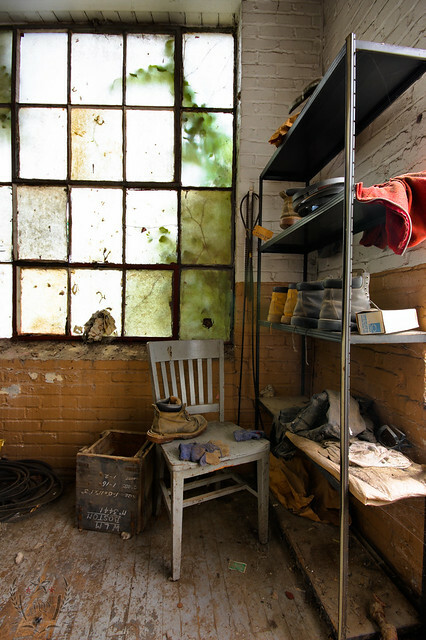 The complex of three buildings stands at the lower end of Manayunk, once a part of an industrial landscape that included the Pencoyd Iron Works, later the American Bridge Company, and the Wissahickon Plush Mill. Surviving as the last of these, the Wilde mill now serves as the gateway to Manayunk from the south, as proclaimed in the sign painted on the Main Street mill. In 1882 brothers John and Thomas Wilde started the construction of a mill on Cresson Street near the intersection of Ridge Avenue. 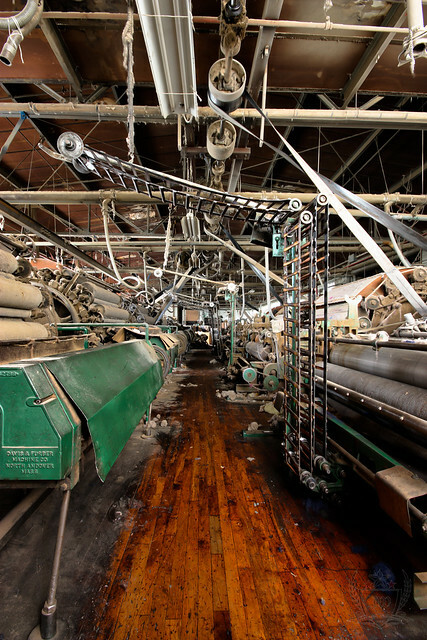 This effort came two years after they had purchased two sets of cards and a mule, and had begun a carpet yarn business, spinning wool on the fifth floor of S.S. Keely's Enterprise Mill. The Wilde's new mill, oriented toward Cresson Street, bares a significant resemblance to the pattern of mill construction prevalent throughout Manayunk toward the end of the nineteenth century. With its rubble stone walls and red brick trim, the mill follows the type built by S.S. Keely. Having been tenants of Keely,it appears likely that he would have constructed their mill. When completed two years later, the date 1884 was laid into the brickwork of its smoke stack where it is still clearly visible from Ridge Avenue. 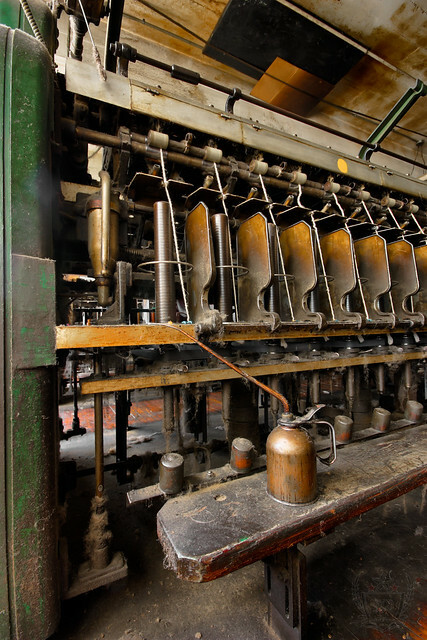 The process of spinning carpet yarn from wool stock has not changed much over the years, with the exception of the introduction of labor saving devices and the evolution of improvements to those machines. At John Wilde and Brother the acquisition of such machines led, in part, to the expansion of the mill. In 1932 the reinforced concrete and brick mill on Main Street was constructed down the rocky hillside from the earlier mill. Its structural system required fewer interior piers which resulted in more open space to accommodate larger, more modern machinery. 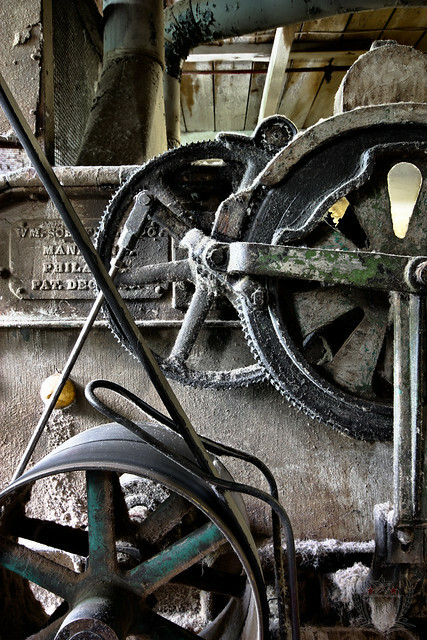 Presently this mill houses the carding, twisting, spinning, and winding machinery. 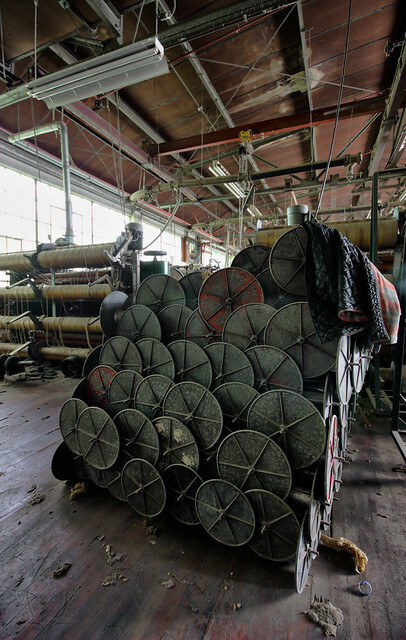 The carpet yarn process at the Wilde mill currently takes place in three buildings, the last one added in 1983; designed by Reshetar Architect, Inc., the reinforced concrete structure embellished with terra cotta tile, stands atop a rubble rock foundation (of the earlier Wissahickon Plush Mill) next to the first mill and serves as a warehouse. 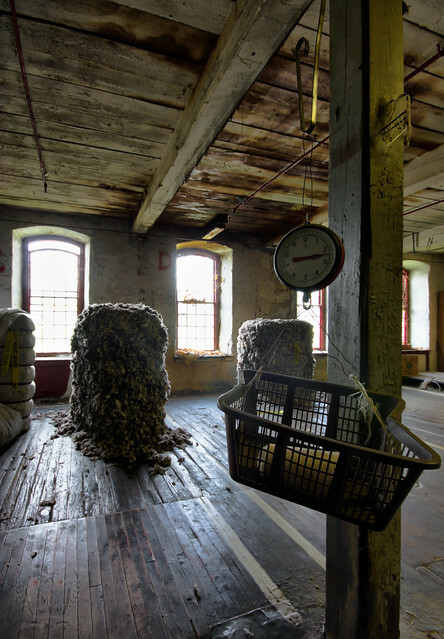 Bales of scoured wool from a variety of world markets arrive at the Wilde mill and are delivered to the warehouse, maintaining the inventory necessary to anticipate and fill its orders. From there the bales are fork-lifted into the top floor of the 1884 mill for blending. As much of the finish product of the mill consists of natural colored yarns, an assortment of wools makes up the inventory. The technique of blending the various colors achieves the distinction in the yarns. 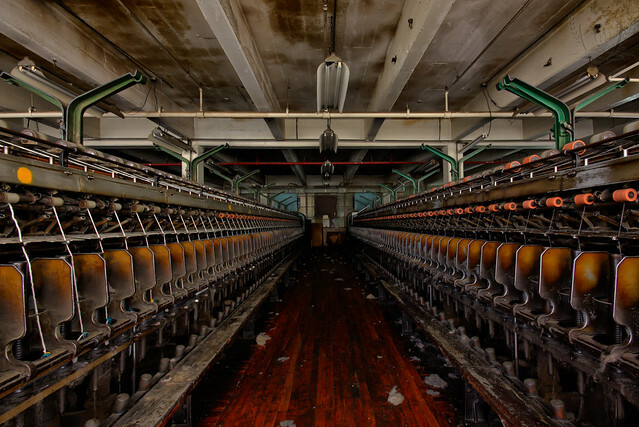 On this same floor six large Lumming feeding machines combine different types of wool to make a homogeneous blend layers, or the blended wool. Next the wool travels to a baling machine. Forced air blows it down to the floor below where it is compressed, strapped and stored as bales. To insure a good blend, the wool is put through this process three times. 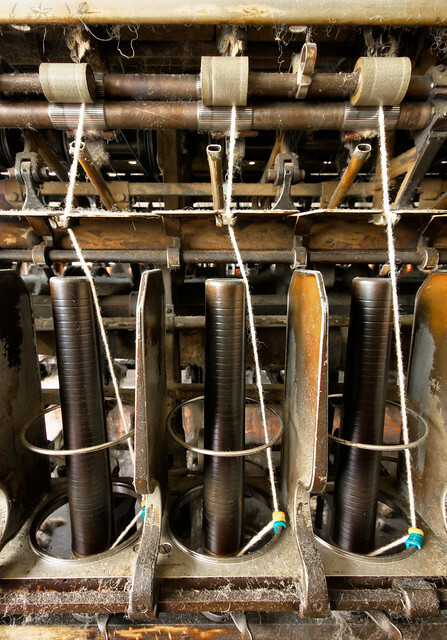 On one of the passes, a lubricant is added to aid in the processing and a pre-carder opens the fibers in preparation for carding. 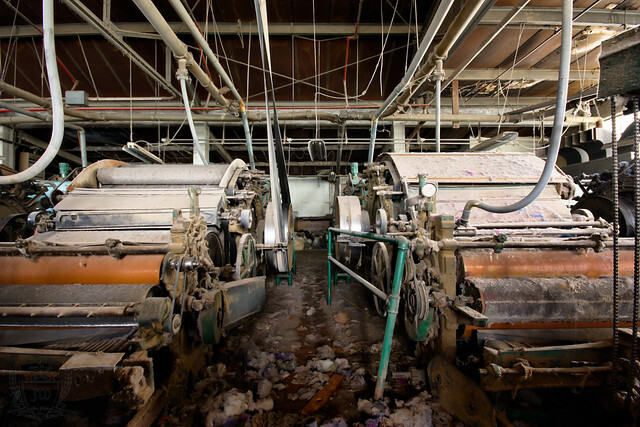 The spinning of a customer's order begins when the bales leave the old mill and slide on an enclosed incline down the hillside between the two mill buildings, landing near the carding machines. 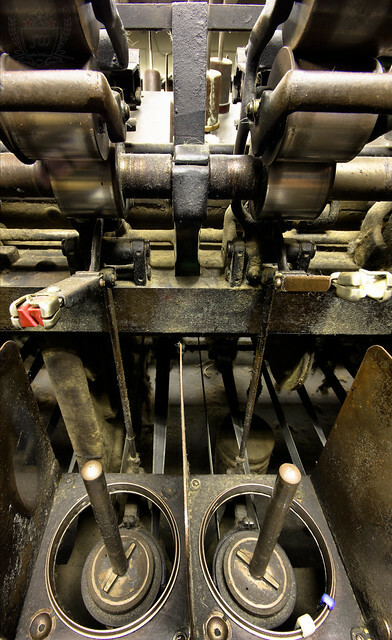 Situated on the top floor of the new mill, six large Davies and Ferber carding machines use toothed rollers to comb the fibers of the wool straight. With accurate measuring devices these machines weigh the raw wool before carding to establish the size of the finished yarn. The product of carding, called roving, looks like finished yarn but has no twist and no strength. Wound on large spools, the roving leaves this floor for the one below where it is placed on continuous ring spinning machines to add the twist. 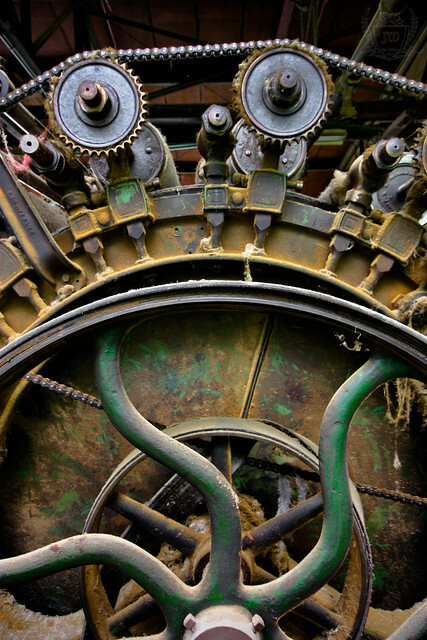 The machines stretch and twist the roving as it is wound onto smaller bobbins. 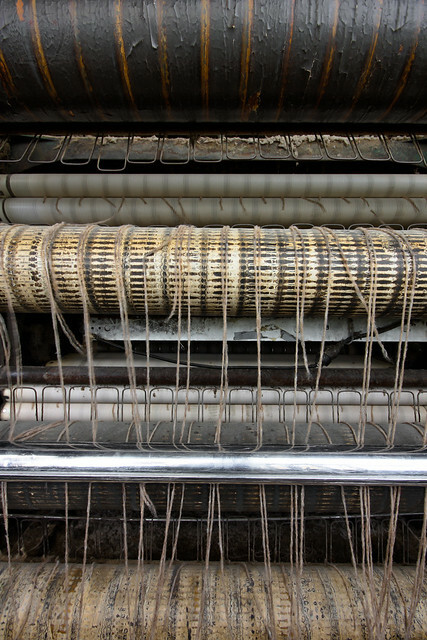 Twisting machines fitted with several bobbins of different yarns twist them together to achieve the desired number of ply. 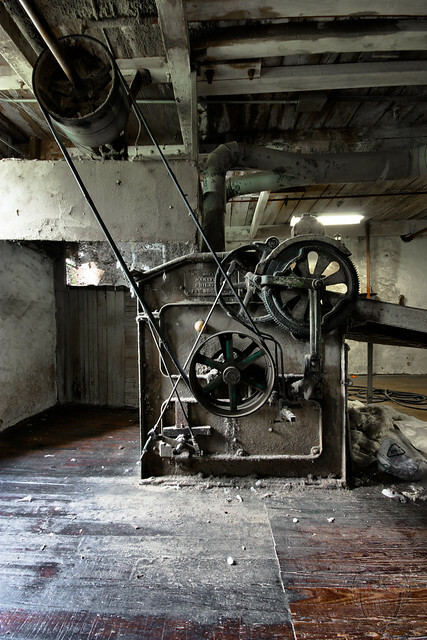 The Wilde Mill has a Saco-Lowell overhead creel-twisting machine on the second floor of the newer mill and Whitin twisting machines on the ground floor of the same mill. 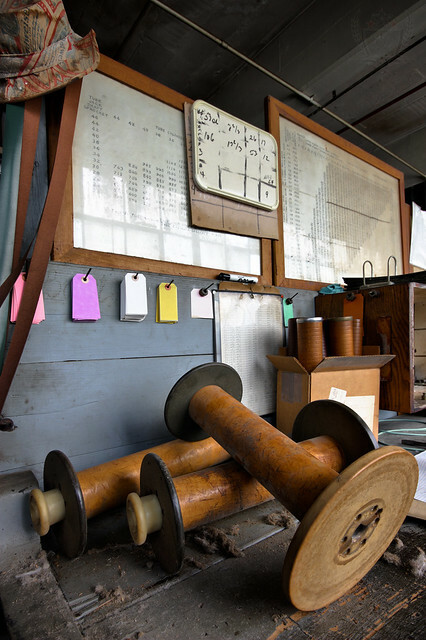 The final process before shipping, involves moving the finished yarns on a winding machine from the mill’s wooden bobbins onto paper cones or tubes for shipping and use by the customer. 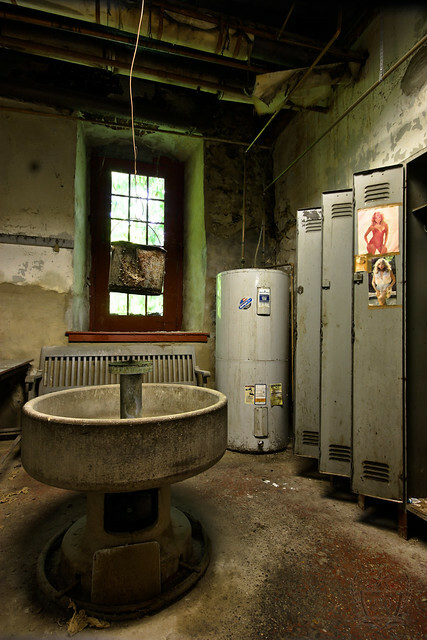 Two other machines, which survive from earlier days of textile production are still in use here. A picker, used for picking spun yarn, returns it to the appearance of the raw wool. 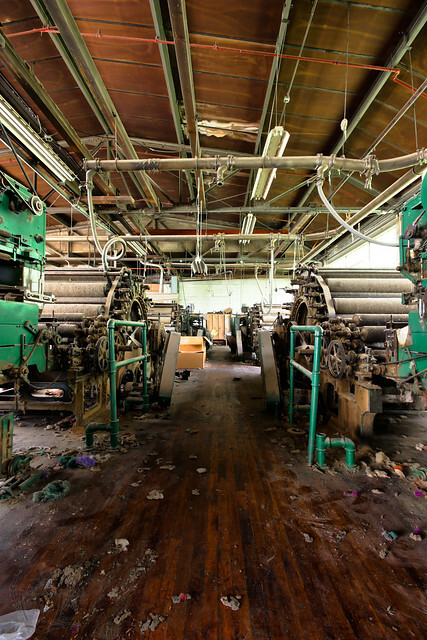 This mill uses the picker for its small pieces of yarn called hard waste. 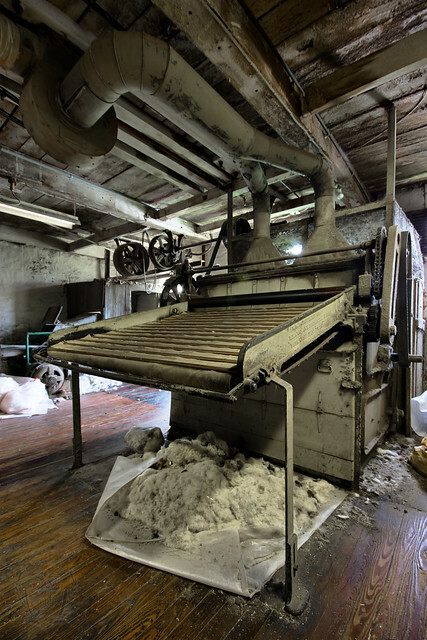 The other machine, a willow or duster, removes short unusable fibers from waste known as fly, also returning it to pre-combed wool. Both the willow and the pickers were manufactured by W.M. Schofield of Manayunk and patented in 1929. 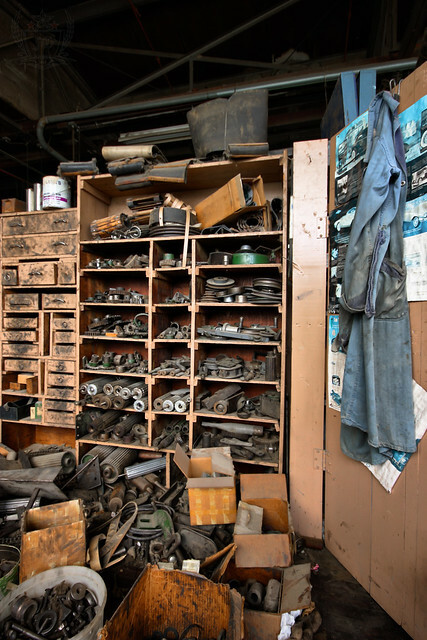 John Wilde and Brother, Inc. and Robert Krook, Inc., 4120 Main Street, survive in Manayunk among the stiff competition of corporate giants, paralleling the recent history of industry in America. 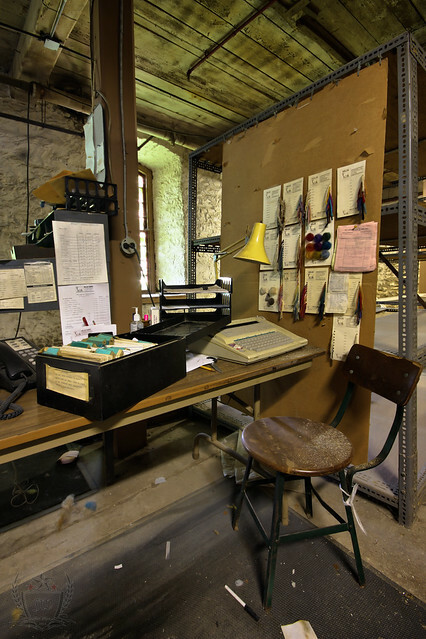 Within the last twenty years in Manayunk, six yarn mills have closed, the last, Blankin Yarn Company, as recently as two years ago. 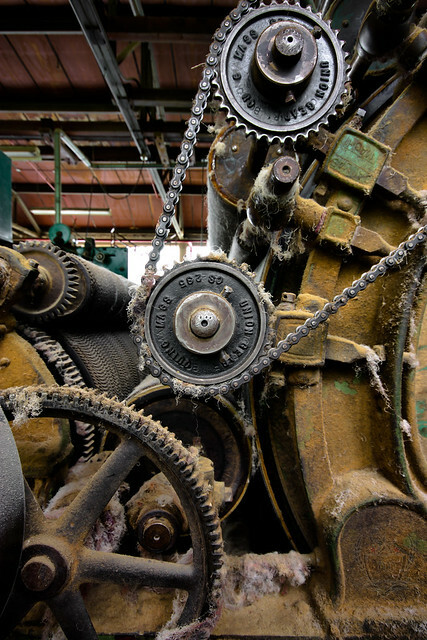 Nice machinary photo shoot.These picture so beautiful.Everything in these picture shown clear parts of every machine. amazing how everything if left behind. Oh wow, time kills everything. To my mind, VDR is one of the most growing industries on the world's market. All of the paperwork is left behind and now it is time to go virtual. So check out virtual data room providers.